The following is a collection of items about private power producers published here over the last decade. The first part is from July 2018. I wrote the oldest segment in May 2009. Corporate media cheerleaders don’t promote private power as they once did. But, they remain silent about BC Hydro paying independent power producers almost $7 billion above market value since 2004. The Press Gallery gang believes that and fossil fuel subsidies are untouchable subjects. But, they’ll regularly ask John Horgan how he can fund affordable childcare or other social programs. Press poodles didn’t ask where money comes from when it was transferred to IPPs, gas producers or other Liberal favourites. The ruination of Ontario Hydro and escalating electricity prices were issues that helped bring down that province’s Liberal Government. Private-power corruption also contributed to Christy Clark’s removal in BC. The Site C boondoggle along with tens of billions of dollars yet payable to private power producers — at inflation protected rates that are a multiple of market price — will result in electricity bills penalizing BC residents and businesses. Current politicians will be condemned for this inevitable outcome. Failure to change BC Liberal energy policies will seal the fate of John Horgan’s NDP Government. As voters in Ontario showed, when a movement to punish a sitting government takes hold because of pocketbook issues, even a former drug dealer with an incomprehensible platform gains favour. The following was previously published at In-Sights but remains relevant. Just to make the story more exquisitely painful, if the HOEP [Hourly Ontario Electricity Price] goes down further, for instance through technological innovation, power rates …go up to cover the losses. Ontario’s policy disaster goes many layers further. If people conserve power and demand drops, …if everyone tries to save money by cutting usage, the price will just increase… Nor do Ontarians benefit through exports. Because the renewables sector is guaranteed the sale, Ontario often ends up exporting surplus power at a loss. I’ve been writing similar information about British Columbia for years but it is not a subject the local corporate press is willing to cover. Here, personal interests and health of the business coalition ranks above the public interest. Strategies at play in both provinces are similar. Politically connected individuals took advantage of citizens’ desire for clean, renewable energy and the Liberals wrote contracts with “lucky firms” that bore no relationship to market prices, guaranteed massive private profits and ensured all financial risks stayed with the public. The contracts in British Columbia last as long as sixty years and allow prices that are as much as 5x market value. In addition, the contracts have annual inflation escalators, a privilege allowed no other commercial segment. Across the continent, demand for power has not grown over the last decade, largely through efficiencies. Actual reductions could be realized by applying improved technologies more broadly but that route is not desired by utilities with surplus electricity to sell. In British Columbia, we are compounding difficulties. Steadily rising purchases of private power add to surpluses and government is rushing to move the Site C dam past “the point of no return” and suspending programs of conservation. All taxpayers get is more power to sell at a loss. I listened to CKNW’s Bill Good interview private power producers at a recent energy conference. Good was a cheerleader determined to broadcast a story that reflected positively on his guests. He helped push the story that BC Hydro has too little financial and intellectual capacity to be an effective power producer and that private companies are best able to ameliorate environmental risks. Is this the same BC Hydro that operates more than 30 hydroelectric facilities and contributes billions to the public treasury by generating and distributing power throughout 95% of this province? And would that be the same private sector that remediated polluted mining sites and avoided serious pollution by smelters and pulp mills? Nor, on April 11, did Sean Leslie and Gordon Campbell have time to answer a caller’s allegation that Campbell associates, former ministerial aides and advisers, left public service to work for private power companies after government approved numerous contracts. Public Eye Online editor Sean Holman writes that private power producers employed numerous Liberal insiders to further their development projects. Holman aptly titles his comment From one power source to another. Bill Tieleman’s May 5 blog lists reasons why Campbell Liberals should be booted from office. One comment attached to Bill’s entry provides interesting detail of Liberal apparatchiks who fit Holman’s description. 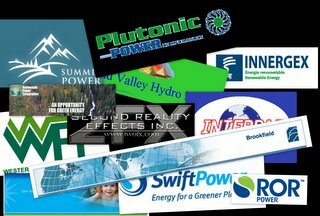 Why have so many BC Liberal insiders moved to the IPP industry where they have dished out $30 billion in contracts for electricity that BC Hydro could produce at a fraction of that? Geoff Plant, former BC Liberal Attorney General, now chair of Renaissance Power. Mark Grant, BC Liberal executive director, resigns December 12, 2008 to join Rupert Peace Power. David Cyr, former Assistant to BC Liberal Minister Mike de Jong, is now a director at Plutonic Power. Robert Poore, recently worked under the Provincial Revenue Minister of the Province of BC, now is a senior director at Plutonic Power. Tom Syer, who has held a variety of senior positions in the BC Government including Gordon Campbell’s Deputy Chief of Staff, is now a director at Plutonic Power. Bill Irwin, after holding key positions in the BC Ministries of Land and Water, and Crown Lands, now is a director at Plutonic Power. Bruce Young, has held several high profile positions with the BC Liberal party and lobbied his own party on behalf of Katabatic Power is listed as a director of Atla Energy. Stephen Kukucha, former senior policy advisor for the BC Ministry of Environment, is now president and CEO of Atla Energy. Paul Taylor, after his work as President and CEO of crown corporation ICBC as well as high level positions in the BC Government, is now President and CEO of Naikun Wind Energy Group. Michael J. O’Conner, former President and CEO of Crown Corporation BC Transit, now holds senior positions at Naikun. Jackie Hamilton, formerly held various BC Government environmental assessment and regulatory management positions, is now a VP at Cloudworks Energy. And last but not least, Bob Herath, former Assistant Regional Water Manager for the BC Ministry of Environment is now with Syntaris Power. Bob Herath signed water licences in 2006-7 that are now owned by the same company he left gov’t for in 2007: Syntaris Power. I remember the days of misguided youth when I was too involved in party politics. While raising funds to subsidize Young Liberals traveling to a national leadership convention, an MP gave me a list of federal contractors who could be counted on for contributions. Businesses providing goods and services to government were expected to spread cash around when the governing party came calling. Mind you, I could only access small sums. Real opportunities were always reserved for the favored few. Well connected Liberals have a long and proud history of maximizing personal opportunities. They know how to make meaningful asset transfers with great discretion. After all, that is the fundamental purpose of an unprincipled political party. Demand forecasting: foolishness or falsehood? Interesting article Norman. Yes, I found my way over from Harvey’s site and I’ll be back. Where are the NDP ads. regarding this power issue? I'm going to assume you've already seen this campaign… but this is very much in tune with your entry. If nyou haven't, watch 'Power Play' here. (Kelly) Reichert is talking to (Dave) Basi, so why is Kelly telling Dave that “Dave” has the first one? They're referring to another Dave, someone involved with the Camosun Guys, such as the college where there is a BC Young Liberal group. Any comment I might make would be either obscene or libellous, so I’ll refrain. Talk radio wasn’t always that way nor was it intended to be. The huge loss of BC HYDRO would not have been a 2017 story, only breaking because of people with guts like Norm Farrell but a day by day expose from 2002 on if men like Frank Griffiths, not grey faces like Corus Radio, owned the stations. The end of real talk radio morphed into Corporate Blowjobs of the Air, the robbers have won and the public has been fleeced. There’s only John McComb left and valiant though he is, real talk radio must have everybody in the station, especially ownership, completely committed flat out. Look at BC HYDRO, look at ICBC, Look at a Provincial debt doubled in a decade, look at the poor, the ill, especially the mentally ill, the abused women and abanboned kids … now look at the empty studio with the lonely microphone and connect the dots. Bill Good was nothing more than a shill for Socred/Liberal interests and was a leading cheerleader with the likes of Vague Palmer BS Baldry & Bula, and Mike “whats-his-name’ for the neoliberal/Gordo/Clark form of government. Hydro, transit, fishfarms, BC Rail, all the same Herr Goebbels school of propaganda; “repeat a lie often enough and the public will believe it”. Even today this ignorant Postmedia/CORUS Crown still remind everyone of the NDP mess (there wasn’t one) and Fastferries (while ignoring that Gordo’s pet rapid transit project was $1 billion over the original budget and the scope of the project was so reduced it has half the capacity of the Expo and millennium Lines. No, no mention, nothing! It is a disgrace and after meeting jack Webster a few times (at the Cromie household) he would literally crap himself over what is considered reporting today. Rafe, you were removedhat Campbell’s request because he was going to do illegal things, like sell BC Rail, as you would be the only person who had both the guts and goods to take him on. It was coup against the truth, honesty and good government by those who are evil and corrupt. It is a sad reflection. It would be self serving and self congratulatory to agree with you but i’m damned if I’ll leave any doubt on this score – Jack Webster got me into radio, was my mentor and my friend. Had I been in radio, the BC Hydro scheme would have not been well handled in the first instance as I, in lamentable ignorance, had been convinced that private power was better than what I was assured was badly managed public power. One man who asked for anonymity, Tom Rankin, Damien Gillis and others convinced me by late 2005 that I had been hoodwinked, I started to read Norm Farrell and Erik Andersen, visited the ghastly IPP on the Ashlu, and Damien and I formed The Common Sense Canadian to get the truth out about IPPS, their environmental carnage, the payoffs to Liberal pals and the ruination of BC Hydro by Campbell and Clark. Tom, Damien, Joe Foy and I campaigned our asses off in the 2009 & 2013 elections on the issue. I nearly went mad at the frustration of not having a microphone and the CKNW I knew with Frank Griffiths behind me. I assure you that If I had, the entire BC Hydro mess would have been exposed and I have no doubt some cell doors would have been slammed! Corus was part of the corporate elite as was Bill Good, which is not against the law but certainly effectively gave Campbell, Clark and the BC Liberal Party an open invitation to destroy BC Hydro a fact that I assure you would have not have been hushed up had I had that microphone in my hand. Talk radio in my time and before was the way corruption was exposed; it has become the way it’s covered up. The public is the big loser. Ah yes, Rafe Mair, we miss him! Th old “Eye” was a relative by marriage to the late Don Cromie, past publisher/owner of the Vancouver Sun as well a relative e by marriage to one former Liberal Cabinet Minister, who has a local bridge named after him. I also was a frequent guest on the Rafe Mair show, both on NW and on ‘OR. I have been the proverbial fly on the wall. In my long lost youth I have met, Jack Webster, Jack Wasserman; Sima Holt and a lot more. These people were addicted to news and the truth and could not be bought off. And the stories they broke, corrupt police; corrupt politicians; corrupt bureacrats, and a lot more. Today, reporters become politicians or shills and the truth is brushed aside for personal gain. Vague Palmer; BS Baldrey & Bula, all the same, no research and fawning after the current crop of elites. News, as it was, does not exist as it has become well managed lies…..except for our cadre of bloggers who report the truth (they must be because they have not been sued) and fearless tread where the so called professional reporter dares not tread. BC Hydro Site C is one of those stories, as is our Casino Money laundering scandal, all ignored by the mainstream media. Yet our fearless bloggers persist. The truth is out there, just ready to be reported. Speaking of BC Hydro (we were, once in a while), I wonder how much the Site C diversion tunnel cost in relation to the price ($1Billion?) we were offered for BC Rail. There’s only 980 years left on the ‘lease’ of that transaction, then we get it back? As for wondering, I’d like to know if we ever did get the $1 Billion, or was it less $250,000 for tax considerations? I also wonder if GC took into consideration the 1983 Sukunka Tunnel built by BC Rail (for the Tumbler Ridge Branch Line) when he ‘negotiated’ the sale with CN Rail? Does (did) he really think BC Rail (including the electrified tunnel) was only worth 1/10th of Site C? Or put another way, we could have had 10 to twelve BC Rails for the price of ONE Site C?